One of the many wonderful things about NYC: We’re never at a loss for new food and drink experiences. As of late December, NoMad workers and residents now have yet another unique place to unwind and dine after a long day at work—via a back alley just off Park Avenue South. Callejón (“alleyway” in Spanish, of course) is a new tapas bar that just opened up behind Cleo, the fine dining establishment in the Mondrian Park Avenue hotel. You can either get to it by walking through Cleo (if you’re daring), or through the alley entrance behind the hotel just off 30th Street. Once inside, you find yourself surrounded by an eclectic array of “Sharpie murals” drawn by artist Sergio Mora depicting flamenco dancers, toreadors, and other images of Spanish life. Find a private table, sit at the bar, or relax at the large communal table as you enjoy thoughtfully-crafted tapas such as skirt steak toast; shrimp with garlic; lemon and chiles; or serrano ham butter on warm bread. Also, try the daily charcuterie selection, and pair it all with an authentic Spanish wine, sangria, or a build-your-own gin-and-tonic. 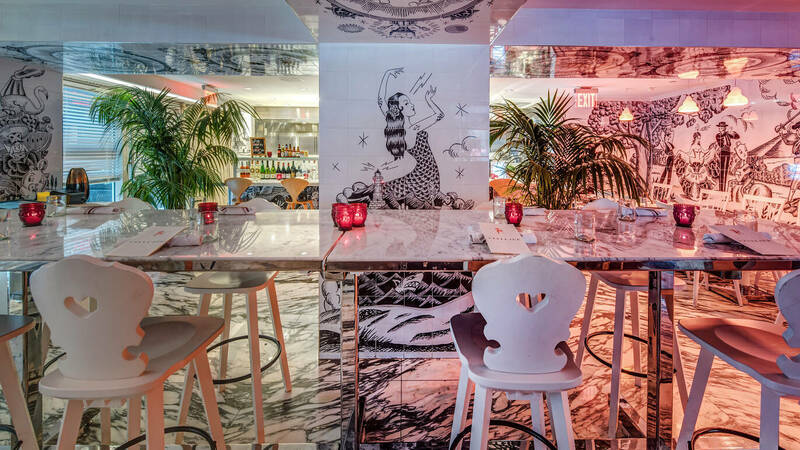 Open just a few weeks, Callejón is already starting to rake in the accolades, garnering a positive review in Forbes and landing on Time Out’s list of the Best New Restaurants of NYC. Tuesday – Saturday: 5 p.m. – 10 p.m. Happy Hour specials are available nightly until 7 p.m.